The fifth instalment in New Line Cinema’s massively successful horror franchise, Final Destination 5 isn’t terribly dissimilar to the films before it, which always center on a character who has a premonition about a fatal accident and must cheat Death in order to prevent multiple fatalities. In this incarnation, Sam Lawton (Nicholas D’Agosto) experiences exactly this, witnessing the death of both himself and his co-workers. No matter how stoic and predicable the Final Destination films have come to be, credit must be given to the filmmakers and writers of each instalment who have always valiantly tried to veer away from the typical trajectory and create something new and exciting with each new instalment. Thankfully, the same can be said for Final Destination 5, in which screenwriter Eric Heisserer not only tries to make at least one character more emotable (D’Agosto’s Sam), but also creates a new rule: if a survivor kills another person they can alleviate death and take that persons place in life. This diversion to the normalities makes for an interesting route to venture down and doesn’t overcomplicate the proceedings, but due to Heisserer’s basic development and scattered administration it merely falls flat as yet another cheap attempt to kill start a franchise desperate for a new beginning. That said, the formulaic nature of the franchise means Final Destination 5 sticks to what it does best: providing a series of intricate and shocking set pieces that are sure to send audiences’ squeal factor into overdrive. It also never takes itself too seriously, which makes it unfair to fault something that’s inoffensive, forthright in its content and that’s providing no-holds-barred entertainment without any overcomplicated setups or crippling emotional trauma. Steven Quale, who boards the series in its fifth incarnation, is thrown in at the deep end after what appeared to be last years final Final Destination instalment. However, with the help of a boost from the third dimension, some nifty camera work, an eerily austere soundtrack and Heisserer’s well-structured script, he makes this film a more befitting closure to the franchise – complete with lurid death scenes tense, revolting and unadulterated fun. Not bad for a directorial debut. Unfortunately, the performances are unyielding, with most of the characters either underdeveloped or simply there as cannon fodder for the shock factor. It’s only Nicholas D’Agosto who makes a noteworthy impression; capitalising on his refreshingly sincere charisma and straightforward talent – remarkable given circumstances. Sadly, the same can’t be said for the rest of the cast, who are adequate at best, barely able to convince of their respective characters’ peril at the mercy of Death. They are all simply too bland and awkward with their performances to make much – if any – of a lasting impression. 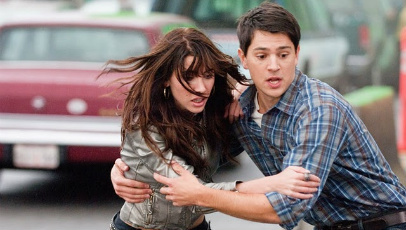 Final Destination 5 may not win the franchise any new fans or reap any huge rewards, but it proves that senseless filmmaking with the right ingredients can be fun. If New Line are smart, they’ll end the franchise here, on a tolerable high. The producers have brought the franchise back to basics with more gruesome deaths and a twist that will have the audience wanting more from the series. However, as fun as the death scenes are, everything else feels tedious and cheesy. Good Review! Check out my site when you can!